“Woe to that one by whom the Son of Man is betrayed! It would have been better for that one not to have been born!” Jesus spoke these words about the impending betrayal by Judas. When someone says, “So-and-so will wish he’d never been born!” they are usually referring to a desire for revenge. Should we assume the same about Jesus? If we do, we are declaring Judas the one person Jesus refused to forgive. As our ultimate example of compassion and mercy, does it seem more likely Jesus spoke words of vengeance, or of profound sadness over his friend’s fate? Other than the betrayal itself, perhaps Judas’ biggest mistake was seeking forgiveness from no one but the same religious leaders who funded his wicked purpose. Not knowing Jesus would rise in three days, he saw no opportunity to ask Jesus directly. Though he flirted with repentance, Judas ultimately decided he was beyond redemption, and set his sights on the hanging tree. In the most immediate possible sense, he was unable to know the forgiveness of Christ. How do we imagine the Christ of the gospels would have responded if Judas had survived to ask forgiveness of him? We’ll never know, because Judas settled for the verdict of the chief priests. Sometimes when we do terrible things, our guilt convinces us we have committed the one unforgivable sin in all the world. We accept the verdict of our own religious leaders, families, or hearts. We decide we are beyond redemption, and follow a path validating that decision. We believe we are unworthy to even ask for redemption. We go through the motions of church and life, all the while feeling filthy and hollow. But what if we dared to ask Christ for forgiveness? More unthinkable, what if he forgave us? Then we might have no choice but to forgive ourselves. What an overblown opinion of ourselves to say to Christ, “My sin is greater than your grace.” It is our understanding of mercy that is too small, never Christ’s. The only thing really standing between Christ and us… is us. 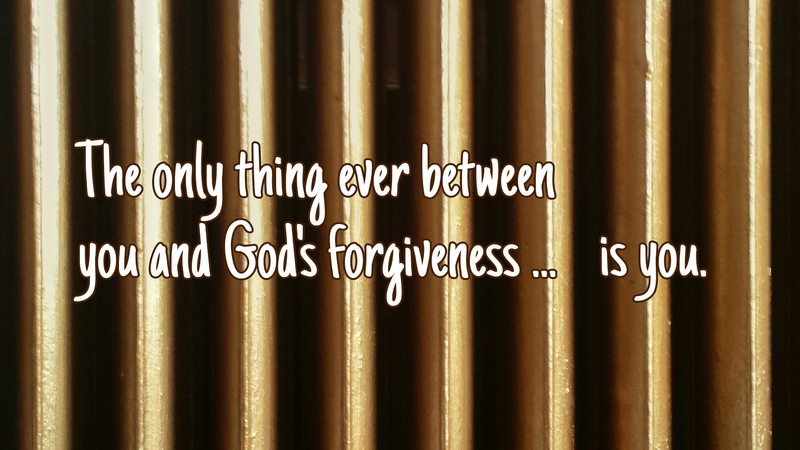 Comfort: It is never too late to experience God’s forgiveness. Challenge: On one side of a sheet of paper, write down things you have trouble forgiving yourself for. On the other side write “God forgives me.” Burn the paper while offering a prayer of thanks. Prayer: God of all Creation, thank you for your endless mercy. Amen. Discussion: How difficult do you find it to forgive yourself?